Flat cable jewelry chain sold by the foot. Classic cables with machine flattened links to increase the light-catching surface area on the metal. Flat cables are lightweight, delicate jewelry chains for charms and pendants. See product detail pages for quantity break discounts when you order 10 foot, 50 foot or 100 foot spools. Our wholesale chain pricing is extremely competitive. Compare for yourself. 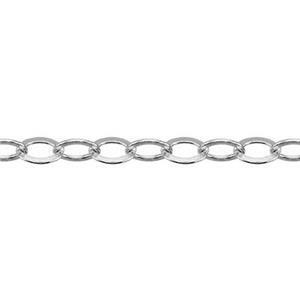 Halstead is widely respected for our selection of high quality sterling silver chains, gold filled chains and more. Finish your own chains with lobster claw clasps or spring rings.